Prior to his renunciation of the world, Gautama Buddha was the Indian Prince Siddartha. He rode the grey horse Kanthaka in all his exploits and defeated many opponents thanks to the qualities of this animal. The close relationship of Siddartha with his horse and with his groom Channa is emphasized in all Buddhist texts. 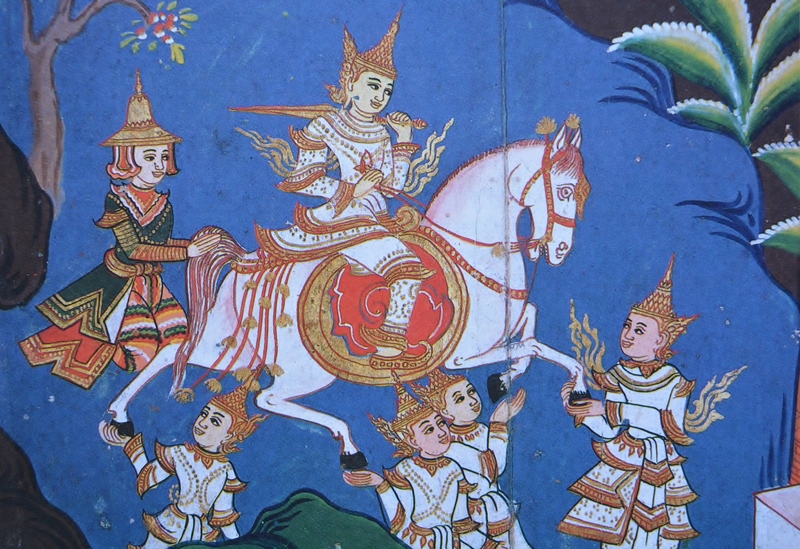 Here we see Siddartha secretly leaving the palace on his horse while the horse’s hooves are supported by the gods, so as to prevent the guards from hearing the hoof beats. This is the beginning of Siddartha’s road to ascetism. Later Siddartha will dismount and send his groom and horse back to the palace. The important role of Kanthaka and the groom Channa is illustrated in all representations of Buddha’s life. It is an example of the special relationship between man and horse resulting from their achievements together. In Buddha’s life the end of this close relationship is the convincing symbol of Siddartha’s renunciation of the world. Horse and groom reluctantly accept the ending of the relationship and Kanthaka is said to have kneeled down to lick his rider’s feet as a farewell gesture. This scene is also often illustrated in Buddhist art. (Information from Dr. W.R. van Gulik is gratefully acknowledged. See also Museum Volkenkunde in Leiden, The Netherlands, where a large exhibition is devoted to The Buddha, until 14th August 2016).